In a clearing in the woods high on the side of the valley with spectacular views down over the Dart Estuary, is our woodland camp. It’s a 10 min walk through the woods to the camp and your nearest neighbour is a farmhouse over a mile away. This is the perfect location for a group who wants to have their own private gathering and you can sing songs around a roaring camp fire late into the night. The main living space comfortably takes up to 30 people and has a log fire and kitchen with gas cooker. There’s no electricity so we use gas lanterns and candles for lighting. There’s no mains water so we have 2 great compost toilets. There’s no street lights so you can see a billion stars in the sky! There’s 4 big sleeping shelters and we provide you with sleeping mats. Kay our brilliant chef prepares the most delicious feast which your instructors will serve to you. 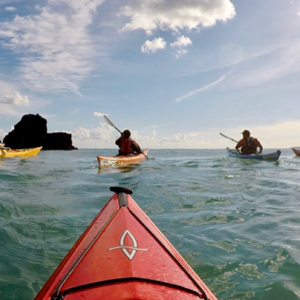 A great option is to start your weekend in this camp, arriving on Friday evening and then after a hearty breakfast on Saturday set off on an overnight trip in the kayaks, camping on a remote beach on Saturday night. 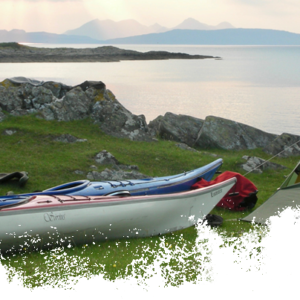 Alternatively you could spend 2 nights at the woodland camp with a day’s kayaking on the Saturday.